are there any tests included with the level 4 set? No…this curriculum doesn’t use tests. Is it possible to view the table of contents for level 4 please? Yes, if you click on “Read Sample” below the product picture, it will download a PDF sample that includes the entire Table of Contents. I have a 5th grader who complete FLL 1 & 2 as a 2nd & 3rd grader, but hasn’t done organized Grammar since. Should I go through FLL 4 with him or go on with Grammar for the Well-Trained Mind? My daughter is 10 and a half years old. She has some basic knowledge of grammar. She reads alot and can write alright as well. I’m considering skipping first language lessons level 3 and just doing 4. Is that advisable or is level 3 necessary? Does level 4 do a good enough job of reviewing concepts in level 3 so that she’d be able to benefit? Definitely alot of the stuff in the beginning of level 3 is something she’s familiar with and we’d go through it very fast. But the later lessons she isn’t familiar with so if those are covered again in level 4 in a sufficient way, that’d be perfect. Please advise me. Yes, for that situation it would be fine to start with Level 4. It reviews previous topics (that were covered in levels 1-3) before introducing new topics. If I have a 7th grader and 8th grader, where is a good place to start them at? Hi Laura. The 4th grader should start with FLL 4 (the student will use the Student Workbook; you’ll use the Instructor Guide). The 6th grader can start with our middle-grade curriculum, “Grammar for the Well-Trained Mind.” You’ll use the Instructor Text for all four years of that middle-grade curriculum, and the student will use a different Workbook (plus Answer Key) for each year of the program. Purple is available now; that’s where the 6th grader should start. I have a child going into 5th grade. We have not used this curriculum before but I would like to start. What level should we be using? If we start in the later level (for example, level 4) will he still get the foundation he needs? Yes, you can definitely start with level 4! It reviews earlier concepts before introducing new ones. I have a daughter who is beginning 4th grade. She has not had heavy grammar instruction in school thus far (no FLL at all), and I am wondering if I should start her in Level 3 or Level 4. I appreciate any advice offered! She can start with 4. 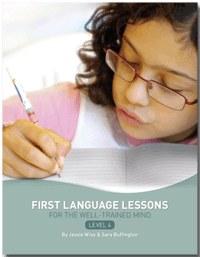 It would also be fine to start in Level 3, but Level 4 reviews most of the Level 3 concepts while it introduces new material, so she should be OK.
We have done grammar instruction…FLL level 1 and 2 as well as Shurley English level 1. I started him doing FLL 3, even in fourth grade. Should we stick with level 3 or move to level 4? I don’t want him to miss anything but I also don’t want to stay somewhere that may be too easy for him. Unless he’s struggling with the concepts, it would be fine to go ahead and try Level 4 now. If we’ve done very little grammar instruction with my high schoolers, were would you suggest we start? We are about to finish level 4. What would we use for 5th grade? You would use our new middle-grades curriculum, “Grammar for the Well-Trained Mind.” Look for the “Intermediate Grammar” category in the sidebar. I just started using FFL 4 with my 4th grader a few months ago (we are new to homeschooling). He is only on lesson 18 or so. I’m wondering if I should continue working on level 4 through 5th grade, or stop using it and skip to the new Grammar curriculum? He doesn’t struggle with grammar at all and is doing well with level 4. But I don’t want it to be too easy for him. You should definitely go through all of Level 4 before starting on the “Grammar for the Well-Trained Mind” curriculum. It’s important to do them in that order…and there’s no rush for him to start the next level, since he’s only in 4th/5th grade.